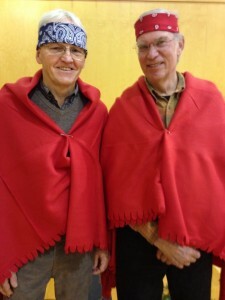 Their ceremony was to “stand up” the representatives of the communities who are presenting to the Board; this means that they wrapped those speakers with a blanket. This blanket represents many things, but in this case, it is to recognize the person whose responsibility it is to carry our collective message to the National Energy Board. They invited every single intervenor that was going before the NEB in Burnaby, and invited us to send our “speakers”. The ceremony was conducted in the Halkomelem language with consecutive translation into English. The Tsleil-Waututh Nation felt that was important that we somehow work together and they believed in doing ceremony before such momentous events. Mike Fenger and Garry Fletcher went over to North Vancouver and represented the Board of Friends of Ecological Reserves. The Tsleil-Waututh are Coast Salish people who speak the Downriver dialect of the Halkomelem language, and are closely related to but politically separate from the nearby nations of the Squamish and Hwmethkwyem (Musqueam), with whose traditional territories some claims overlap.